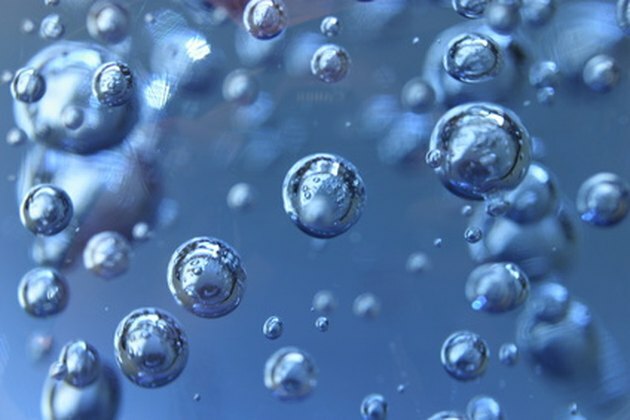 Carbonated water is made by infusing water with CO2, which creates the bubble effect. Carbon is found in the atmosphere and is a subject of concern as humans watch the Earth's "carbon footprint" grow. Increasing greenhouse gases like carbon are changing the climate and pose a potential threat to global health. CO2 is a plant fertilizer. It is a part of the photosynthesis process and plants can't produce plant sugars without it and sun. Carbonated water has positive and negative effects on plant growth. Carbonated water helps plants grow. As a crucial part of photosynthesis, carbon is already an important aspect of plant growth. The carbon in carbonated water is also beneficial for plant growth. High carbon levels allow plants to grow faster and larger and enhance drought tolerance. The drought tolerance is because higher levels of CO2 mean the plant doesn't have to open its stoma to allow the gas in. This decreases evaporation so the plant conserves more water and needs less. Carbonated water contains macronutrients that are essential to plant growth, according to researchers at the University of Colorado. The nutrients found in carbonated water are potassium, carbon, oxygen, hydrogen, phosphorus, sulfur and sodium. The researchers used the plant baby's tears as a test subject. Some plants received tap water and others received carbonated water. The carbonated plants grew more than twice as large as the tap water plants. The nutrients are already dissolved, which makes it easier for the plant to uptake them before they leach out of the soil. Some future forecasters have proposed the use of CO2 in greenhouses and over field crops. The theory is that the CO2 will grow the plants bigger, better and faster and thereby solve the world hunger crisis. However, not every plant can handle excess CO2 as it can change soil pH into an unsuitable level. It is true that the increased CO2 causes the plant to produce phosphoglyceric acid, which is the first step to photosynthesis. This creates carbohydrates for plant growth and could cause crops to grow faster and more healthy. For increased growth and greening in plants, the carbonated water should be slow-dripped into the soil. This will give the plant adequate time to utilize the CO2 and other nutrients. The plants are watered with the normal amount of carbonated water as compared to regular water initially. The plant will not lose as much moisture through its leaves so over time, watering with the carbonated water can gradually decrease. After several weeks the plant's water needs will have diminished but it will look healthier and will be taller and larger. How Does Sugar Water Affect a Plant's Growth? Can Gatorade Make Plants Grow Faster?